A new study has found that 5.4 million UK adults are ‘completely perplexed’ by Wills and ‘would not know where to start’ if they wanted to write one. 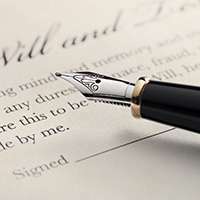 The research by insurer Royal London found that more than half (54 per cent) of adult respondents did not have a Will. Among parents, that figure was slightly higher, at 59 per cent. Of those surveyed that did not have a Will, almost a quarter (24 per cent) said that they had no intention of making one in the near future, while more than a third (34 per cent) said that only an major life event – such as being diagnosed with a terminal illness – would encourage them to make one. Conversely, the survey found that of those that did have a Will, more than half (53 per cent) had not updated theirs to reflect important life events such as getting married or having children and were, therefore, relying on an outdated document. The study’s authors said that too many people across the UK were underestimating the importance of Wills and that their families could find themselves in a difficult situation in the event of an unexpected death. They added that it was “especially important” for parents to ensure they have an up-to-date Will in place, as this is the only way they can control who will look after their children when they die, and to make proper financial provision for their children by setting up a trust.